The Pyramid Society now offers official certification for your Straight Egyptian Arabians. These beautiful certificates, ready for framing, are available at the low cost of $15 for members or $10 for members ordering 5+ and $25 for non members or $15 for non members ordering 5+. 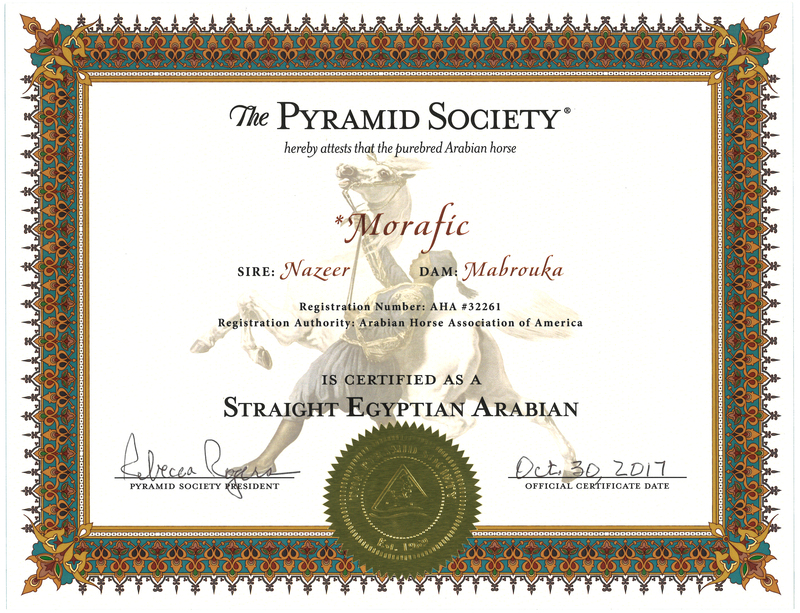 Whether you are breeding, buying or selling Straight Egyptian Arabians, or just have one to love and enjoy, be sure your treasured horses or horses are certified as Straight Egyptian by The Pyramid Society! DISCLAIMER: Although care has been taken to issue this certificate based on information provided by an Arabian Horse Registry approved by the World Arabian Horse Organization, the user of this certificate agrees it is governed by the substantive laws of Kentucky and The Pyramid Society shall in no event be liable for any direct, indirect, special or incidental damage resulting from, arising out of, or in connection with the use of this certificate.